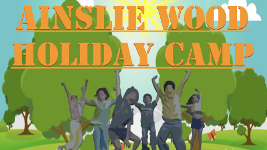 Booking system provided for Ainslie Wood Holiday Activity Camp by Kids Club HQ. Please note that your personal details and those of your child(ren) or child(ren) you care for supplied during the booking process will be held and/or computerised by Kids Club HQ and Ainslie Wood Holiday Activity Camp for the purposes of processing your booking. Your personal details will be safeguarded and will not be divulged to any other individuals or organisations for any other purposes. Joined-up Solutions Ltd (trading as Kids Club HQ) are registered with the Data Protection Act 1998 under the number ZA159194.